In 2016 Google launched its Accelerated Mobile Pages (AMP) project and since then it has made websites come to life for the viewers quite faster than before. AMP is now being used by almost all the Best Responsive web design companies around the world. The reason responsive web design services are using AMP is because with it Google has not only made the AMP enhanced sites faster but it also comprises of and powerful content distribution network along with good technique. As a result of this AMP has encouraged the web designers as well as responsive web design companies in India to work towards better optimization and find the best-practices that AMP contains. Even if you are one of those developers who is not going to create an AMP complaint website still it would be useful for you to understand the AMP as part of a to-do list. The reason that AMP is going to be one of the topmost trends in the coming years is that of its features. One such component of the to-do list for non-AMP website optimization is the ‘lazy-loading’ technique. This is a technique in which the images on the website starts loading in or around the viewpoint when a visitor opens a webpage. The remaining of the images start appearing as the webpage is scrolled down. AMP also allows the developer to optimize the lazy load of background images. Generally, on opening a webpage the entire content of the page is downloaded on the first time. This enables the browser to cache the webpage, however, this does not guarantee that the viewer will view the webpage in its entirety. In such a case when the viewer leaves a page in the middle this means the bandwidth and the memory have been wasted by loading the entire content. Lazy loading is a process in which the content is not downloaded in bulk at one go; rather the content is loaded and displayed to the user as s/he accesses the particular part of the page. In lazy loading, the webpage areas that are not being viewed by the viewer has placeholder content that is replaced with the actual content only when the user accesses it. As already mentioned earlier that Lazy loading saves the bandwidth and memory it also has few more benefits for the users and the website owners. A better balance between can be reached with lazy loading between optimization of the content delivery and give a streamlined experience for the user. The website content is downloaded faster since only a portion of it gets downloaded therefore the chances of the user connecting with the content is higher. With less time for the content to be downloaded the retention of the customer is higher as continuous content at a faster speed can be fed to the user. This also means there is a reduction of users leaving the website as they do not have to wait for the full content to be downloaded. Lowers the resource cost of the business as only the content the user sees is delivered. Despite these benefits, the only drawback that lazy loading has is its impact on the website’s SEO. This is because the search engine when goes through the website misinterprets or ignores the placeholder content and the resource. Hence the content is bypassed by the search engine, as a result, the ratings on the search engines go down for the web pages that stand fully on lazy loading. However, there is a way to navigate or bypass this pitfall. It can be achieved by providing the links to the lazy loading content. This enables the search engines to index the websites and then the content of these websites. The method basically structures the website made with lazy loading a traditional website. This effectively brings the website back into the search engine list while the content is loaded dynamically. 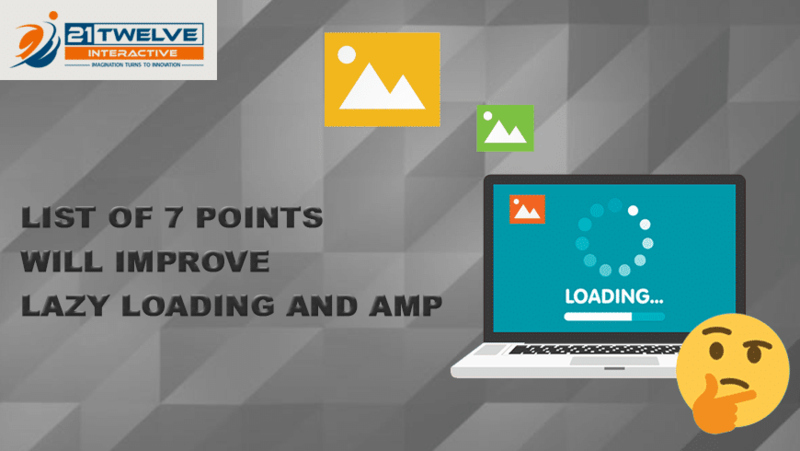 To be a creative best responsive website designer and development specialist here are 7 points that will improve Lazy Loading and AMP. This is enough for optimizing the preliminary downloading of the images while the rest will continue to download automatically as the user keeps scrolling. To do this just modifies the images to lazy load, which will ensure that their ‘src’ property is pointed towards a blank or to a ‘loading spinner’. Next, you have to use ‘sata-src’ or similar custom attribute so the reference of the real image is stored, which should be loaded lazily. The actions will enable you to optimize the work and load the real images once the webpage has been loaded. This way the target images are relegated to load asynchronously once the page is loaded and this will ensure the pages and the images loads faster while help with your SEO. It is only minified by 1kb and the without any additional features or trimmings focuses only on lazy loading images. Inside a scrollable DIV, this will not work. Unlike Echo.js, BLazy.js is a bit larger as it minifies the image by 1.6kb. However, with these extra bytes while creating websites with the AMP you will get quite a few added features. With Blazy.js you will be able to not only lazy load both front and background images but also based on the device sizes you can have different variants of lazy images. E.g. you can lazy load responsive images for 480px or less for a device while the same image for 720px or less for another. With BLazy.js you can also have the option of lazy loading high-resolution images for devices with retina display. Additionally, Blazy.js lazy load images inside the scrollable containers. It also does not depend on libraries such as jQuery. However, there is a negative aspect of BLazy.js, i.e. it does not have an in-built image transition or loading mode when it is being revealed. But it can be rectified by using the callback function or by defining the specific CSS class that contains the CSS3 transition effects and apply it. If jQuery is already being used for your website then you definitely should consider using jQuery plugin for lazy loading the images. Or else do consider that jQuery automatically hits 32kb to your page by itself (minified), but in all likelihood it is cached. The script allows the images to be lazily loaded in both horizontal and vertical layouts. The plugin comes with another additional optional plugin with a size of 2.27kb. The plugin also has a CDN hosted version, which means it is not required to upload the files to the server. All these features will help in AMP lazy loading, but the only drawback of jQuery is it is fully dependent on jQuery. This lazy loading plugin that can be immensely helpful for websites with AMP since it is packed with features with its add-ons, do not think of them as additional plugins. The stock script of XT jQuery, which is about 3kb, minified supports the lazy loading of images inside the scrollable containers. It allows both horizontal and vertical loading and setups of ‘infinite scroll’. The most interesting feature of XT jQuery is when an add-on like .js or .css file is used. With this add-on, you can have a default animated spinner as part of a transition when the image is being loaded. You can introduce a customized fancy transition for the lazy loading of the images with Animates.css. It works with Lazy Load XT that can give a countless number of transition effects. Furthermore, the ‘responsive image’ add-on of this script will allow you to have different sizes of images for different devices. Also, you do not have to upload any file to the server because it supports CDN hosting and also it can lazy load different media types. XT jQuery requires jQuery 1.7 for working. Lozad.js allows you to lazy load images but also videos, iframe, and others. The Intersection Observer API is also used by Lozad.js. Additionally, with Lozad you have the option of importing it with the choice of your module bundler and also include it with npm/Yarn. Since with Lozad is supported by CDN hosting you are not required to upload the file to the server. The details on how to use the library can be found in detail on the Lozad Repository of GitHub. So in case you are not interested in working with the Intersection Observer API despite it having the option or into just fast implementation of lazy loading that can apply to a range of content, Lozad.js is the lazy loading script for you and the AMP. But do remember to eventually integrate the library with polyfill so that it is part of the Intersection Observer API. This script works with a variety of contents like videos and iframes and not restricted to images. Also, it is packed with features and uses the Intersection Observer API. Yall.js also typically can work as a traditional handler when required. Furthermore, it gives magnificent browser support and does not have many dependencies. Read more – How To Develop Google and User-Friendly Website? Many web designers and designing companies use WordPress for websites and for them too there is the option of lazy loading the images to ensure better performance of the website. 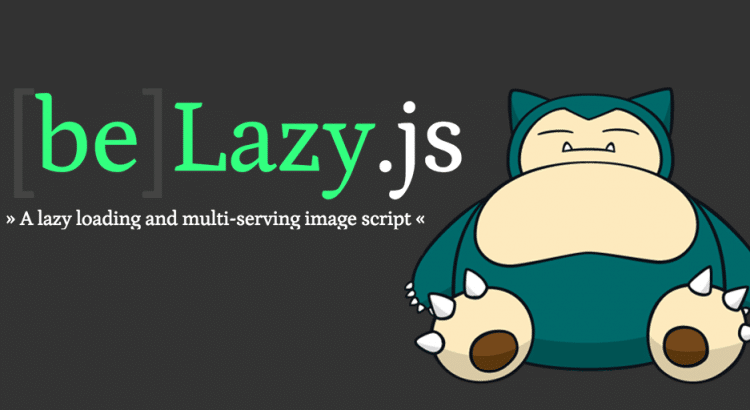 Here is a list of 7 scripts that can help WordPress web developers to install lazy loading. It is already a known fact that images attract the viewers to the websites and keeps them interested in the web pages. But images and videos are the primary factors that bog down the page with its downloading times. With Lazy loading images, the worry of website slowing down can be eradicated. Mainly with AMP in the picture lazy loading images have become crucial because the website designing is changing as clients are looking for responsive websites to their customers. This translates to the fact that best responsive web design companies will have to take lazy loading and AMP into consideration while developing the websites.